On World Ovarian Cancer Day, celebrated this year on May 8, women fighting the disease have new reason to hope. This international awareness day was created to build solidarity among women with ovarian cancer. For decades, researchers have been trying to unravel the mystery of why up to 85 percent of women who undergo the standard treatment (surgery and chemotherapy) for high-grade serous ovarian cancer – the most common subtype of ovarian cancer –experience recurrence of the disease. New research published by Dr. Sanaz Memarzadeh, of the Eli and Edythe Broad Center of Regenerative Medicine and Stem Cell Research at UCLA, may hold the answer to this mystery – and lead to a new combination therapy that could effectively treat up to 50 percent of women with ovarian cancer. 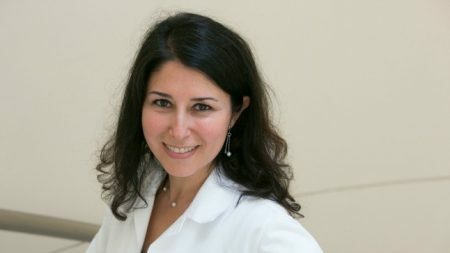 In 2015, Dr. Memarzadeh, a professor of obstetrics and gynecology in the David Geffen School of Medicine at UCLA, uncovered and isolated the ovarian cancer stem cells that cause recurrence and identified a drug that she suspects could be combined with standard treatments to stop these cells in their tracks. In a study published last month, Dr. Memarzadeh and her team found that this combination therapy doubled the survival rate in animal models of ovarian cancer. The research team went on to test the therapy on 23 high-grade serous tumors created using patient samples collected during surgery. The combination therapy eliminated 50 percent of ovarian cancer tumors in the laboratory. After noting this significant outcome, the team tested the combination therapy on tumors created in the lab using bladder, cervix, colon and lung cancer cells (all of which can have a similar resistance to chemotherapy) and found it to be effective at targeting a subset of those tumors, too. Memarzadeh, who is also member of the UCLA Jonsson Comprehensive Cancer Center and director of the G.O. Discovery Lab, is now working to bring this promising treatment to clinical trial. If this trial is successful, the combination therapy could improve survival rates for ovarian cancer.